Home Wedding Planning 101	What Should Your Bridesmaids Pay For And What Should You Have Covered? Getting married could be quite money consuming, inline with that don’t keep costs a secret. it’s advisable you share the expenses with close friends and family, most definitely your #Bridesmaids fall into one of these category. We know that asking your bridesmaids to pay for certain things can be tough and it can get awkward when your expectations don’t line up with theirs especially when they’re doing so much to support you already. Whether it’s coordinating the bridal shower or bustling your dress at the wedding, to be honest about what you expect from your crew, up front about all costs associated with their commitment and willing to compromise wherever you can. If you’re gracious and understanding, they will be too. Here’s a complete guide to what bridesmaids are and aren’t typically expected to pay for. Traditionally, how your bridesmaids get to the wedding and where they stay is on them, but they should feel comfortable discussing their financial needs with you. If it’s in your budget, consider going halfs on travel and accommodations you can definitely help them out by reserving hotel room blocks so the prices are at a discount. Bridesmaid dresses, shoes and accessories (including jewelry, unless you’re gifting it to them) are their responsibility. 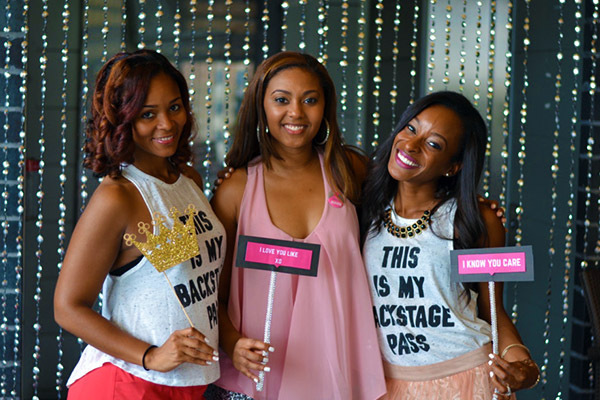 Depending on who’s hosting, your maid of honor and bridesmaids are often expected to foot the the bridal shower bill. But if your family is hosting (or co-hosting), a portion of the costs and responsibilities from décor and activities to food and beverages will fall on them. One wedding gift is usually enough and a bridal shower gift is by no means required. But if the party has a fun theme like a lingerie swap, it’s possible to participate without purchasing a huge gift off the couple’s gift registry. In money, time and effort, your bridesmaids are paying for a lot, so don’t be shocked or offended if they don’t get you a wedding gift. If they do plan on gifting you something, they can always go in on one thing with other bridesmaids. You might prefer to receive one nice gift over several less expensive ones anyway. The bride and her family are expected to pay for the bridesmaid bouquets and other floral accents like corsages. Traditionally, the bride and her family are responsible for coordinating and covering day-of wedding transportation ( to and from the hotel, ceremony and reception). However you, your fiancé and your families divide it up, your bridesmaids shouldn’t have to worry about this one. This one’s a little trickier, but if you request that your bridesmaids get their hair and makeup done professionally, then you should pay. If you’re impartial, but your bridesmaids insist on using a professional glam squad, offer to split the bill or pay for it as their bridesmaid gift otherwise, they can cover their own beauty services. If you plan to spend the night in a shared hotel suite with your pals on the eve of your wedding, expect to cover the costs. Your bridesmaids may have already split a room with a plus-one for the duration of their stay, and they shouldn’t have to pay for yet another room.